As the partial government shutdown goes into its second month, it isn’t just impacting the pocketbooks and wallets of furloughed workers, but also affecting American optimism about the state of the country’s pockets overall. 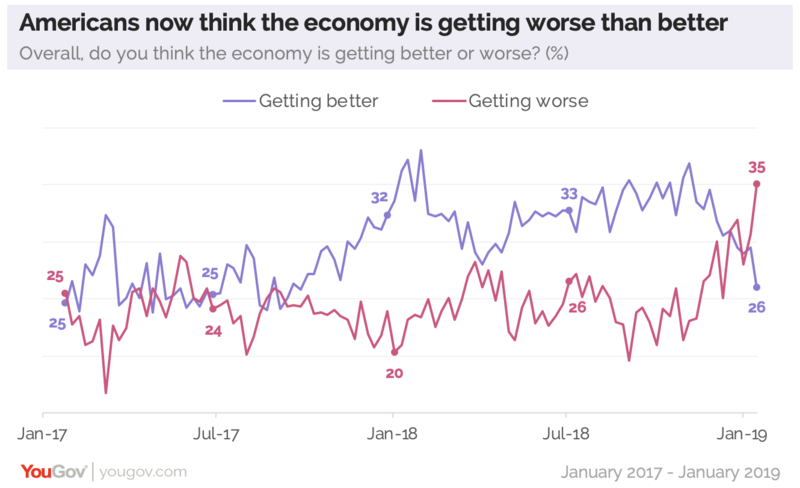 In the latest Economist/YouGov Poll, the proportion of Americans who believe the US economy is getting worse has jumped in the last week to 35% — the highest level seen during the Trump Administration. Republicans are less likely than they were a week ago to say the economy is improving, while Democrats are more likely now than a week ago to say it is getting worse. But party differences remain, with those in the President’s party optimistic and those outside it pessimistic. Independents and Democrats are more likely to say things are getting worse than better. 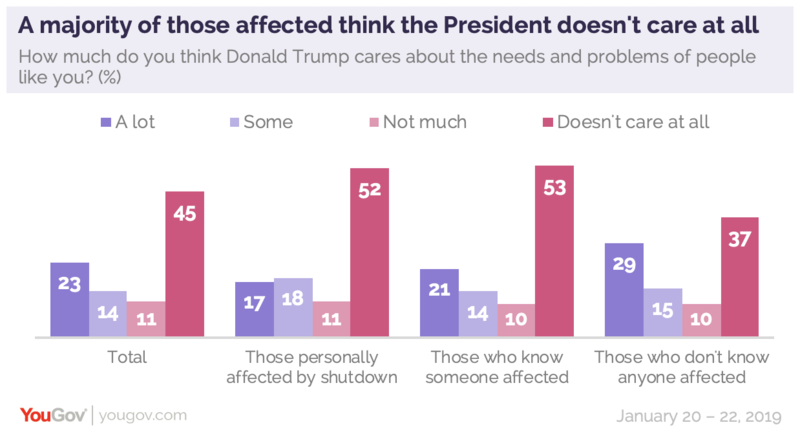 But those affected by the shutdown (nearly one in four have been personally affected; half say they know someone who has) are particularly concerned about the economy, much more than the 46% who say they don’t know anyone who has been impacted. The effect of the shutdown is spreading slowly. Last week, 50% had no contact with anyone affected. More than four in ten of those who know someone or who say they have been affected see an economy headed in the wrong direction. (Some respondents both have been personally affected and say they know someone). 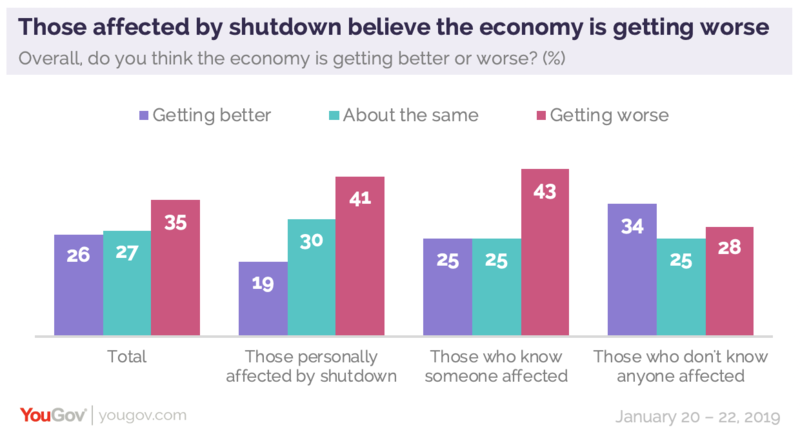 Democrats are more likely to know someone affected by the shutdown personally; however, all three groups are more negative about the economy than they were a week ago. A good economy had been one of President Trump’s strengths. It has been the issue area where his approval rating has been the highest, outpacing the evaluations of his performance on other issues. However, this week as many disapprove of his handling of the economy as approve. The President’s overall approval remains where it has been for much of his Administration: 40% approve, while 52% do not. Just over a third of those affected by the shutdown approve the President’s job performance. A majority of those affected believes he cares not at all about their needs and problems. That is the opposite of what Americans say about their own feelings. A majority say they care “a great deal” about government employees affected by the shutdown. That includes nearly half of those who don’t know anyone affected. This is a shutdown with no known end in sight. 37% say they have no idea how long the shutdown will last. 40% expect it to go one at least two more weeks, with those affected possibly missing not just a second paycheck (that will happen this week), but a third. There is a lot about how political leaders have behaved during the shutdown that people don’t like: the President, House Speaker Nancy Pelosi and Senate Majority Leader Mitch McConnell all get negative assessments from the public on how they have handled the shutdown. By 56% to 36%, Americans disapprove of how President Trump has handled the shutdown; by 46% to 36%, they disapprove of Pelosi’s management and by 51% to 22%, they disapprove of McConnell’s shutdown performance. 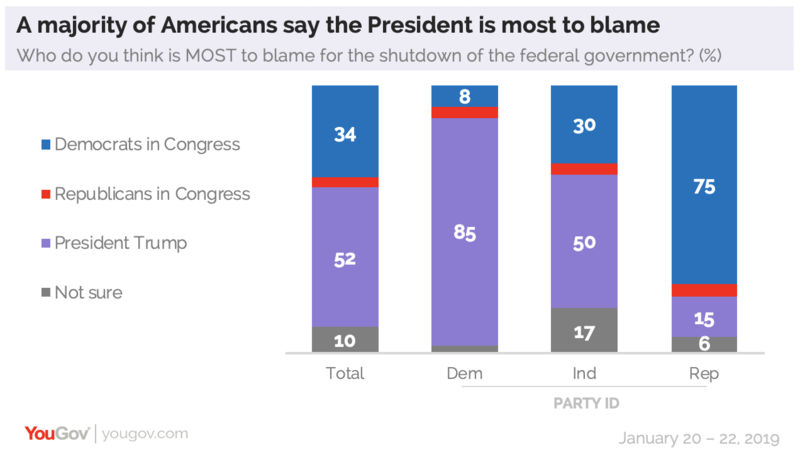 As to whom they blame most for the shutdown, a majority overall (and 50% of independents) believes the President is most responsible. But there is much to dislike about Congressional leaders’ particular decisions, too. 51% disapprove of Senate Majority Leader McConnell not holding votes on bills passed by the lower House (a third of Republicans agree). The public divides evenly on Speaker Pelosi postponing the date of the President’s State of the Union message because of the shutdown (only 17% of Democrats disapprove of that action). 43% overall (and 22% of Democrats) disapprove of Pelosi’s planned trip to Afghanistan, which was canceled by President Trump. Less than a third overall approve (including half of Democrats). 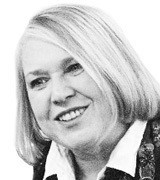 The border wall – which remains at the heart of the dispute – continues to be opposed by a plurality of the public. The President’s Saturday compromise proposal (rejected by the Democrats) included border wall funding and a three-year extension of protected status for “Dreamers” and some others in the U.S. temporarily. 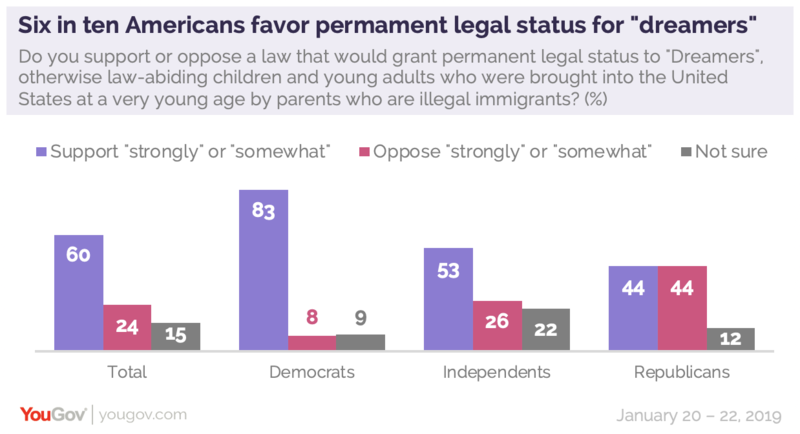 Most Americans would do even more: six in ten favor permanent legal status for “dreamers,” including 44% of Republicans.